It’s a saddest thing to be ill in life, personally saying that I hate to be ill. I hate medicines but when we are suffering from illness, we have to take it to get well soon. I think sometimes it’s good to be ill because we can know that for whom we are special and who is going to take care of us. And I think it’s good that we get some times to take rest because our body also needs some rest after doing whole day work and from our routine schedule. We feel special when our loved ones taking care of us and are with us all time. 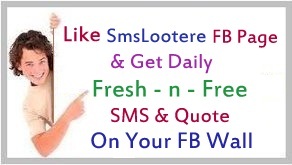 A Get Well Soon messages from our near one can make us feel good, so SmsLootere.com team doing the best to provide you best so say Get well Soon to you dear ones who are ill at this time. Sending My Brightest Wishes, To Say Hope You Get Well Soon. Hope Today Finds You Feeling Much Better! The Stars are Watching Over You is Make a Bright Star of You. Get Soon Well! Why U Choose this Particular Time to Get Sick, Seems to Us an Insensitive Choice. I Know it is no Fun to be Sick. So have all Your Medicines on Time and Get Well Soon. Our Prayers are with You, Get Well Soon. I’d Wave My Scepter Over You Until You were Okay. Praying and Hoping for a Smooth and Quick Recovery. Please take it with Your Medicines to Get Well Soon. Sending My Warmest Hugs and Wishes. May You Regain Your Strength and Feel Better Soon. 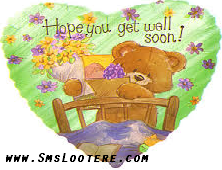 Wishing You to Get Well Soon. You are Just a Few Degrees Away From this Beautiful Weather. Please get Well Soon, Lots & Lots of Love.. Sometimes Words are not Enough to Describe My Feelings 4 U! I Hope that U will Come back Home Healthy as soon as Possible! You are Unwell is My Perfect Chance to Get Back at You. Get well soon Dear. Tight Hugs and Sweet Kisses… to make You Feel Better! You’ve just been Hugged by Me! There should be Well Enough Soon! Take care of Yourself My Friend. We Hope to See You. Up & Running and Back Again, the Place isn’t the Same without You..
Sending Warm and Lovely Wishes to Brighten Up Your Day.. I Miss Your Laughter and Your Vibrancy. Wishing You a Fast Recovery.. Get Well Soon. So let’s Count the Hours to it. Please Accept My wishes and Get Well Soon. I Feel so Bad to Hear that My Dear Friend is not keeping well. Let Me Know if I can be any Help. An Apple a Day Keeps the Doctor Away.. Get Well Soon. You shall soon Recover. Get well Soon. To a Friend who is Ill. May all the Messenger of Health Attend You and Speed a Swift Recovery! Prayerful wishes for a Miracle Moment to Brighten Your Day. Get well soon. A Little Sunshine for You… to Help You Feel Better! Get well soon. Get Well Soon so People at Work don’t Realize You do Nothing Around Here. If You weren’t so Likable, then maybe those Darn Germs wouldn’t Like You so Much. Get Well Soon! I miss Acting Like a Fool in Public with You. Get Well Soon! So We can make Fun of You again and Not Feel Bad. Feel Better. But in Meantime, Keep a Safe Distance, Please. Don’t Look so Worried! Those Doctors know what they are doing. Hang in there, and Get well soon. Wishing You a Speedy Recovery from Your Imaginary Illness. Get Well soon before the Company Realize You’re Expendable. “I’m Sick of You being Sick!” Get Well Soon.